Outside my apartment there are lots of great deciduous trees. And right now they are full of red and orange and yellow leaves. I love that. 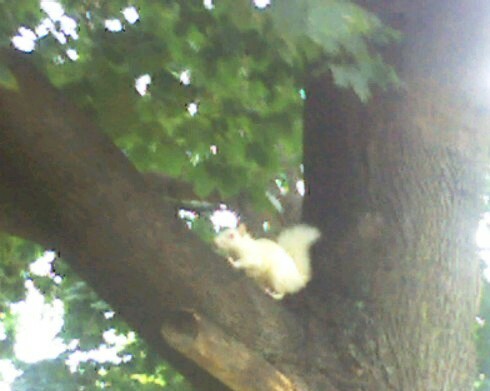 One tree today was full of an albino squirrel. If you have never seen one before they are just as they sound. White with red eyes. At first I thought it was a little white cat. But no, it was a squirrel. And kinda ugly freaky looking too. In China, a white squirrel is a sign for a healthy ox slaughter for the New Year. At least that was in a cookie I had at China Happy Yum Yum. One in a million shot, though! Wow, all that picture needs is a midget on a unicycle and some go-go dancers, and it would be EXACTLY like this dream I had last month. I then used the dream for this fan script of the TV show “Reba” I wrote, and sent in to the producers at the WB. They wrote back to say they liked my albino squirrel/unicycle midget/go-go dancer script, but unforuntately Reba McEntire is allergic to rodents. Bummer. aww. that is THE CUTEST THING EVER! Do you feed him peanuts? I should feed it peanuts. I used to do that when I lived in Seattle, and they loved it.